This redoubtable old warhorse has only had two owners from new and has never been restored, yet still delivers a fine ride today. There’s something special about an old, unrestored motorcycle. It is still an inanimate object but it is given life by its wonderful patina of faded paintwork, the dents and scrapes from its scores of adventures and journeys acquired over the years. 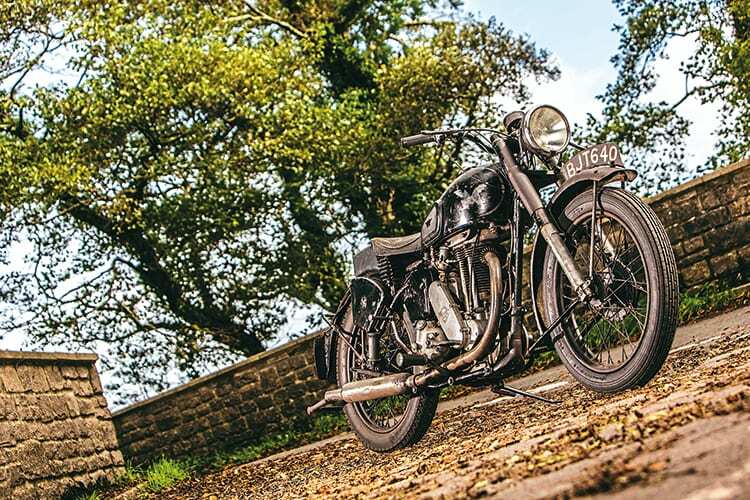 This 1946 G3L Matchless certainly ticks all of the correct boxes and is one of a collection of similar unrestored machines belonging to west country enthusiast Ron Axon. I initially met Ron at last year’s Bristol Classic Motorcycle show where he was displaying a very rare 1966 175cc Bridgestone and in conversation I soon discovered the Japanese lightweight was just one of a dozen others or so that share space in his well-equipped Dorset workshop. Later in the year, I went along to sample six of his British classics and what better way to start than by riding the oldest in his diverse line-up, a 1946 G3L Matchless. The 350cc ‘lightweight’ (that’s what the ‘L’ stood for) single shows a shade over 30,000 miles on the clock and amazingly Ron – who for much of his working life was a self-employed car mechanic – is only the second owner of the rugged ‘Matchbox,’ a bike which, as he told me, was stripped and then left in the roof of a garage for 40 years, until he acquired it in 2003. But before we hear about the Matchless, Ron explained a little about his two and three-wheeled association, which started over seven decades ago. “Although my father wasn’t a motorcyclist, from an early age I was fascinated by them. I learned to ride on a 250cc BSA, belonging to a chap called Don Chambers, on the local rubbish tip and my first machine was a 1935 Blue Star, which before I was old enough to ride on the road was used for tearing around the local fields. On leaving school in 1946, I took a job working in Purbeck Motor and Transport Company doing all sorts of things, including paint spraying and demonstrating the Dot three-wheelers tradesman devices, which were popular at the time. This lasted for two years before I received my call up papers for National Service and due to my previous experience, I was enrolled in a fitter’s course, something which stood me in good stead when I returned to civvy street in 1950. “On my discharge from the Army, I had a 150cc BSA and over the next decades I had all sorts of bikes including a 500cc Ariel Red Hunter, a JAP special with a Vincent frame, a 350cc AJS, a Douglas, sprung hub Triumph Thunderbird and when I started courting June (‘Tib’) – we were married in 1960 – I then bought a Morgan three-wheeler. “The Morgan was great fun but I never lost my love of motorcycles and with an enthusiastic wife who also rode there was always at least one in the garage, including one of the first Honda CB400 fours which I’ve still got. During the 1980s I had several large capacity multi-cylinder Japanese bikes, but my love of old British machines never went away and over the years I acquired several interesting two-wheelers, including the G3L Matchless. Since then Ron has added several hundreds of miles to the indicated 30,000 showing on the speedo and on club runs it always creates a lot of interest. BJT 640 was first registered in 1946 and like many of its siblings was very much a clone of the Army issue G3Ls, 80,000 of which were produced for the military during the Second World War. In fact, although the G3L became a hugely popular machine for the Army, it’s interesting to note that had Triumph’s Priory Street works not been destroyed by the Luftwaffe bombs in November 1940, then the production numbers of the ‘lightweight’ 350cc Matchless would have been considerably less. Looking to replace their fleet of motorcycles after the withdrawal from Dunkirk, the British War Office had carried out lengthy tests between Triumph’s 350cc vertical twin – this had a top speed of over 70mph and weighed 240lbs – against the newly announced G3L Matchless. At the time the Matchless was a real innovation with its trendsetting ‘Teledraulic’ front forks – the first telescopic design with oil damping – and their designers had managed to reduce the weight of the G3L prototype by over 56lbs against its G3 forebear. But it was discovered the ‘lightweight’ was a bit of a misnomer as this didn’t take into account the additional Army equipment that needed to be added. After a series of exhaustive tests, the war office decided that the twin best suited their requirements but before any production could begin the Triumph works, including all of the technical records, drawings and designs, were lost to the German bombers. Production of the G3L began in late 1941 and from the following year the entire output of Matchless machines was dedicated to the 350cc single. Read more in the April issue of TCM – on sale now!